Your engagement is a special time for each of you, for your families and friends, and for your entire parish community. This is a time of new beginnings, of love, of promise, and of hope. The Church is blessed and encouraged by your willingness to make this commitment of life and love to each other. Your wedding celebration will be a special and grace-filled time in your lives. The Church welcomes you to celebrate and solemnize your wedding in the context of Christian prayer. You are expected to contact Ken Stanczyk ten (10) months before the time you wish to marry. If you or your parents are not registered at St. Joseph Parish, and if you are not registered at any other parish, you must register in the parish first before a wedding date can be finalized. Once you are registered, the Parish Office can provide you with information regarding the availability of wedding dates at St. Joseph and give you a Wedding Information Packet. In the Wedding Information Packet you will find a “Pre-Nuptial Information” sheet. Fill this form out and return it to the Parish Office along with your deposit of $200.00 to reserve your wedding date on the parish calendar. This is an administrative fee that helps to defray the costs to the parish of preparing for and celebrating your wedding. We strongly suggest that you contact the Parish Office prior to arranging a date with a reception hall or caterer. After the Parish Office receives the Pre-Nuptial Information sheet and $200 deposit, one of the Pastoral Staff will contact you to arrange the first meeting with you as a couple to begin the marriage preparation process. Weddings are usually scheduled for Saturdays with the latest time at 1:30 pm. Other days and times are possible, depending on the parish and presiding priest’s or deacon’s schedule. There are times in the church liturgical year, such as Lent and Advent, when the celebration of weddings is less appropriate. No weddings will be scheduled during Lent. Advent weddings will be scheduled only in special circumstances. A Pastoral Staff member, will provide you with a booklet that explains the various parts of the wedding liturgy. After your initial discussion, you will need to contact the parish Director of Music and Liturgy to arrange a time to discuss the details of your wedding liturgy. 1) Should our wedding happen outside of Mass or within Mass? Some people seem to think that a couple is not really married unless the wedding takes place within a Mass. This is not true. Early in your marriage preparation it will be determined if the marriage should be celebrated outside of Mass (designated a marriage ceremony) or within Mass (designated a nuptial Mass). – the Liturgy of the Word, – the Marriage Rite, – and the Liturgy of the Eucharist (including the reception of communion). – the Liturgy of the Word, – and the Marriage Rite. *The Liturgy of the Eucharist with reception of communion is not part of a marriage ceremony. If your marriage is celebrated within a marriage ceremony, one of the parish deacons may be the officiating clergy, or otherwise known as the presider. Your desires in this matter should center around what form of liturgy will best enable the particular wedding assembly to celebrate with the both of you. If not, how does the non-Catholic feel about celebrating marriage within a nuptial Mass? Has Mass been an important and regular part of your lives. Have you been away from Mass for a long time? Have you committed yourselves to returning? Is the celebration of the Eucharist the best way to help them to be with you and pray with you at your wedding? For instance, if many of your guests are from outside the Catholic community or are non-practicing Catholics, you may want to consider a marriage ceremony rather than a nuptial Mass. In your discussions with the member of the Pastoral Staff, you will be provided with a marriage planning book to assist you. You will use this book to help plan your marriage liturgy. In it you will find options for the exchange of marriage promises (vows), the general intercessions, and the scripture readings appropriate for use at weddings. Besides the suggested scriptural readings, it is also acceptable for other scripture passages to be used. However, non-scriptural passages are never used in place of the scripture. You are encouraged to select readings so that a common thread or idea connects the Liturgy of the Word. If you have difficulty finding readings that reflect the message you want to convey, you should talk to the Pastoral Staff or to the Director of Music and Liturgy for further suggestions. Three readings are normally used: the first one should be from the Old Testament, the second one from one of the epistles (New Testament letters), and the last one, is from one of the gospels (Matthew, Mark, Luke, or John). Your readings serve as a foundation from which your music is selected with the assistance of the Director of Music and Liturgy. You may use the suggested general intercessions or write your own. If you write your own, refer to the format and options given in your wedding planning book. A copy of the written petitions should be given to the person(s) who will be conducting your wedding rehearsal at that rehearsal, as well as the person who will be reading the petitions at the wedding. The “Unity Candle” is a recent tradition that is neither mentioned nor required by the liturgical documents of our Church. However, if you wish to light such a candle after exchanging your vows, it is understood that you will provide the unity candle itself, as well as the two individual candles from which the unity candle is lit, as well as suitable holders for each candle. 3) Who are the ministers for the celebration? In the Roman Catholic tradition, you, the bride and groom, administer the sacrament of marriage to one another. For all of us who are your guests, you become a sign of God’s fidelity and love. We celebrate that sacramental reality with you at your wedding. Ordinarily, the priests or deacons of St. Joseph Parish will officiate at weddings celebrated in the parish. You may invite a priest or deacon who is a friend or relative to concelebrate with the parish priest/deacon, or even to preside at your wedding by himself without the presence of the parish clergy. In this latter case, you first need to obtain permission from the St. Joseph Parish. They will then secure the appropriate ecclesiastical delegation for the visiting presider. In such instances when there is a visiting presider, the preparation process will still ordinarily be completed under the direction of St. Joseph Pastoral Staff . Who will also communicate with the visiting priest or deacon regarding church and parish policy on the celebration of wedding liturgies. In the case of weddings where ministers of other Christian denominations or other faiths are taking part, the appropriate adaptations will be made after consultation with you and the other minister. The Director of Music and Liturgy at St. Joseph Parish usually conducts the consultation and planning session with the engaged couple. The usual practice is that musicians from St. Joseph Parish will be the principal musicians at your wedding. In the event that they are not available, the Director will assist you in securing a guest musician. All music chosen must be in accordance with Archdiocesan guidelines and reflect the religious and sacramental nature of marriage. Also, at the time of the consulting session with the Director of Music and Liturgy, all the liturgical services the parish offers to you are explained. These services primarily include assistance in outlining your order of worship for the wedding and having an organist and a cantor present to enable the assembly’s participation in singing. You are responsible for creating, duplicating and distributing your orders of worship (the wedding programs). You may invite instrumentalists and soloists from outside our parish to be involved, but you are to discuss this possibility first with the Director of Music and Liturgy during your consulting session before making any arrangements or commitments. As a norm, all music involving the participation of the assembly is led by a trained cantor from St. Joseph. *The fee for this service is $200.00 for the Parish Director of Liturgy and Music and $125.00 for each cantor and instrumentalist. This fee is to be paid to the Parish Director of Liturgy and Music. *Any non-parish musician you bring in is to be remunerated by you. Neither the Director of Music and Liturgy nor St. Joseph Parish has any financial responsibility toward outside musicians you arrange. -Do the persons have experience as a lector? -Are they comfortable reading in front of a group? -Do they have the necessary gifts for proclaiming God’s Word effectively and reverently? This includes good posture, good eye contact, projection, and the ability to proclaim slowly, with meaning and good diction. The lectors’ presence at your wedding rehearsal is required. This will give them the opportunity not only to practice in the worship space with the sound system, but also to be informed of logistics. Gift Bearers. If you are having a nuptial Mass, another way for family members and/or friends to participate is by bringing up the gifts of bread and wine for the Liturgy of the Eucharist. Two (2) people are sufficient for doing this. Here again, they should plan on being present at your wedding rehearsal. Eucharistic Ministers. If you are having a nuptial Mass, you or members of your wedding party, family members, and/or friends who are Eucharistic ministers in their home parishes may serve in that capacity at your wedding. They also must attend the wedding rehearsal so that they can become familiar with the worship space and logistics. Ushers (Ministers of Hospitality). In addition to seating the guests, handing out and picking up the orders of worship, and attending to other physical details, ushers help to offer a warm, welcoming atmosphere for celebration by extending a smile and greeting of some sort to those entering church. This simple gesture helps ease the stranger coming to our church for the first time. Prior to your rehearsal, each usher should be given a copy of Appendix B, which lists the ushers’ responsibilities. Ushers are expected to be at your rehearsal. Attendants. Only two witnesses are actually required for the celebration of marriage. The evening before your wedding, at a predetermined time – Normally at 6:00 or 6:30 p.m.
What is needed at the wedding rehearsal? Your rehearsal will begin promptly at the assigned time, and the rehearsal will take no more than one hour. In consideration to all concerned, please be on time. Are photography and videotaping of the wedding allowed? Yes, with certain restrictions. Please see Appendix C.
Is there a bride’s room available? There is a small room available as a bride’s room. Please view this in advance so that you can determine it’s suitability for your wedding party. All personal items must be collected after the wedding, any trash disposed of, and the room left in a clean condition. Should we have a receiving line at church? Receiving lines seem to be more appropriate at the reception following the wedding. Your time to use the church is limited. Because of this, it is suggested that there be no receiving line at the church. May our guests throw rice, birdseed, confetti, etc.? No. To avoid any hazard to safety and to minimize custodial work, the throwing of any substance is not allowed. May the wedding party consume alcohol at church? No. There will be no drinking of alcohol at the church for either the rehearsal or the wedding. Please remember what this day is about. You are celebrating a Sacrament and asking God to bless your union and be part of your life. This is not the time or place to inhibit your awareness of what you are doing. What address for the church should we include on our invitations? We ask the couple to remind their family and friends involved in the rehearsal and in the wedding that they are in a place of worship and should always conduct themselves in a way that shows reverence for this sacred space. This includes proper attire for the rehearsal as well. ►$200.00 payment payable to St. Joseph Parish at the time of scheduling the wedding on the parish calendar – this includes the sacramental fee for the celebrant of the wedding ceremony. 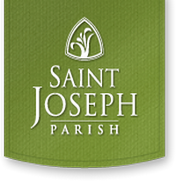 ► If you or one of your immediate families are not registered members of St. Joseph Parish, an additional offering of $400.00 to the parish will be asked at the time of the wedding. ► Information on fees for musicians will be provided by the Director of Music and Liturgy. If you are planning to live in the area after your wedding, we hope you will be part of our parish community. Please feel free to call on us to help you in any way we can. As mentioned earlier, as much care should be taken in planning and preparing your liturgy as is taken for planning all the other aspects of our wedding. If you have any questions along the way, feel free to ask any of the parish ministers involved in your preparation. May your celebration of the Sacrament of Marriage truly be a joyous occasion, reflecting God’s love for you, as well as your love for God and the community that celebrates with you.